Over the last couple of posts we’ve kind of established that reflections can be confusing and can change the way we experience space. But regular readers must know by now that once I’ve caught hold of a thread I’ll pull at it just that bit longer than is reasonable so today is, um, well, more of the same really. Sorry about that. 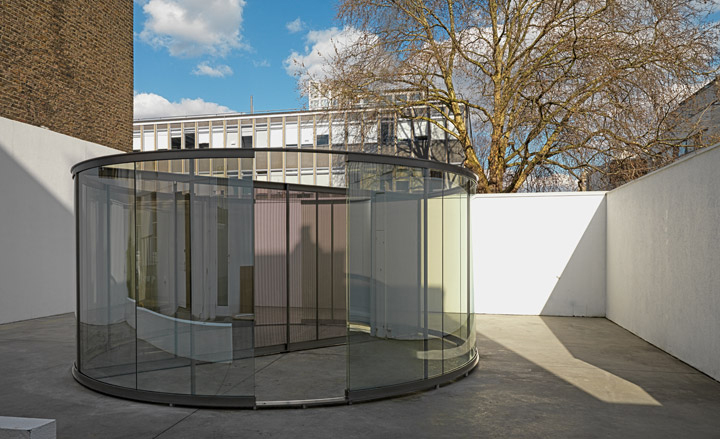 Much of Dan Graham’s work, in particular his two-way mirror pavilions – could be seen as architecture as well as art. The pavilions are small glass structures which are usually partly made of mirrored glass which confuses the way the structure reflects the environment it sits in. The effect of this is that people are prone to wandering in and out of view unexpectedly and the space seems to change as one walks round or through the structure. 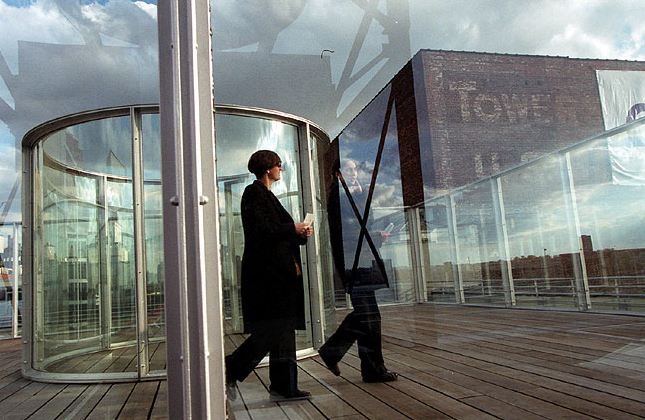 One of the first pavilions I saw in real life was the rooftop one at Dia:Chelsea in New York. This is also probably the most exciting piece I’ve seen by Graham, in the main because it’s always great to get a different view of a city like New York and the work creates some weird layering of the surroundings. Graham’s work – though probably at its best in public places – also works really well in gallery spaces and the Lisson Gallery, which represents him in London, provides a really good environment for the gallery works. 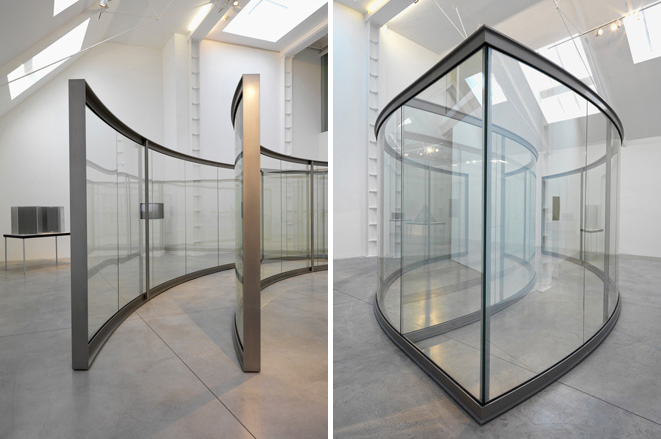 Though I often like the works with flat glass walls more, the curves of the works in Graham’s recent Lisson show create some really fascinating confusions of space. 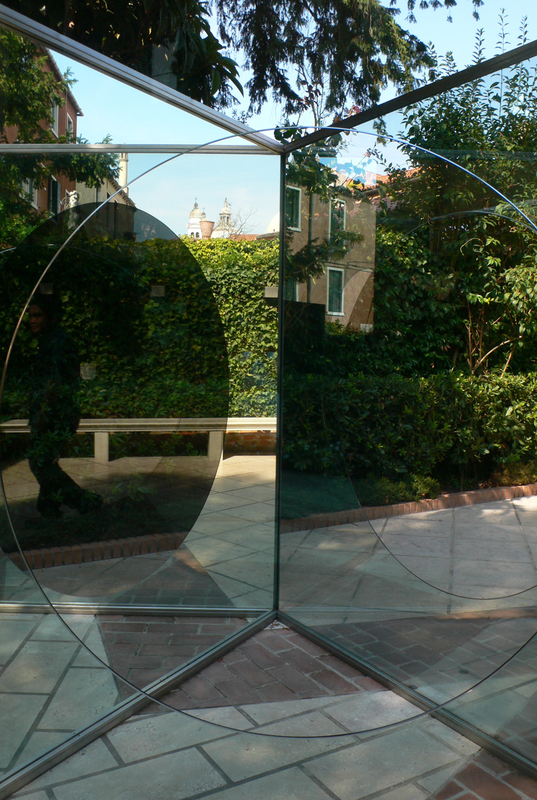 I think what I enjoy the most here is the way it’s somehow possible to feel almost lost within a glass structure. There’s something really intriguing about being able to see out, knowing how to get out but still in an odd way being held within the space by that slight air of things not being quite as they appear. This entry was posted in Architecture, Installation, Intervention, Public Art and tagged 2 Way Mirror Cylinder Bisected By Perforated Stainless Steel, architecture, art, Dan Graham, Dia:Chelsea, mirrors, Rooftop Urban Park Project, Triangular Solid with Circular Inserts, Two 2 Way Mirror Ellipses One Open One Closed, Two Way Mirror Cylinder Inside Cube, Two way mirror pavilion by Ann Jones. Bookmark the permalink.